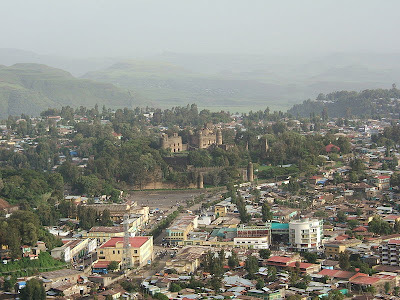 The bad news is that Gonder gets a foot of rain in July. And the 187 kms from the border at Metema to there is dirt, er, soup. 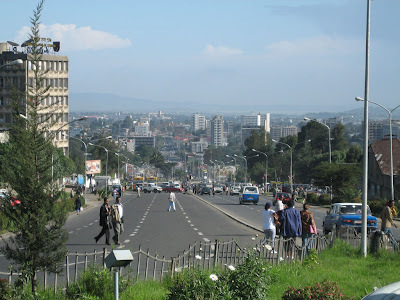 The good news is that the 735 kms from Gonder to Addis Abbeba appears to be paved the whole way. And the 600 kms from Khartoum to Metema is new tarmac. As you all know, we're raising money for Spread the Net during our trip. So far we've had great success in fundraising, having received close to $8000 in donations (of which, of course, we do not take a penny). To increase our fundraising efforts, we are now selling days of our trip. The idea is quite simple. For a $150 donation to Spread the Net, you can buy any day of the trip. You'll be the only person who gets that day. When we return from our trip we'll send you some pictures from that day, a written account, and perhaps some momento like the map section from that day or something we pick up along the way. It will be a way for you to share in our trip and to support a great cause at the same time. To get an idea of what our trip reports are like, feel free to read one here, or here, or here. seven days in South Africa. You can make donations here. If you have any questions please don't hesitate to be in touch. You can also be in touch if you want to tell us we're crazy, but we likely won't listen! Keep well and keep looking ahead! UPDATE: A reminder of how generous our great friends are: we've already sold 9 days! UPDATE2: As of this morning (March 28), we've sold 14 days! UPDATE3: As of this afternoon (March 30), we've sold 18 days! The good news keeps coming! UPDATE4: As of April 22, we've sold 22 days. In looking through some of the blog entries today, I realised that our single biggest adventure to date does not yet have its own write up. Until Peter gets a chance to write-up one of his great accounts of the trip, you can see a slideshow with running commentary here. Briefly, the trip was a 5000km loop of eastern Canada. 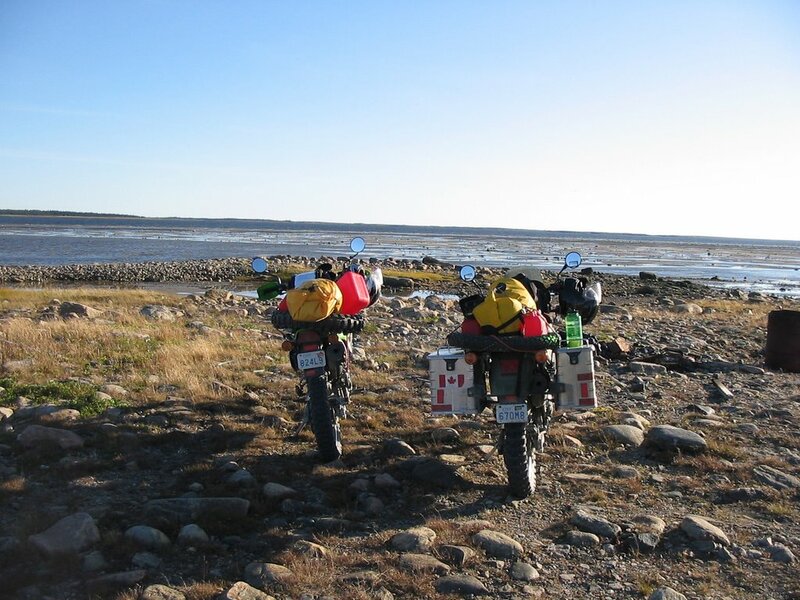 We started out from Ottawa/Montreal, ran the north shore of the St. Lawrence, shot way north from Baie Comeau to Fermont, QC, sped fully across the Trans-Labrador Hwy. to Happy Valley-Goose Bay and on to Blanc Sablon, QC. After a quick ferry ride, we sputtered the length of Newfoundland's Great Northern Peninsula, whipped around Cape Breton Island in a morning, and cruised along the Northumberland Straight to Sackville. Following a couple of days reliving our youth in Bag Vegas, we rode on north through New Brunswick, enjoyed some Meredith hospitality at Riviere-du-Loup on the Saint Lawrence before finally returning back home. 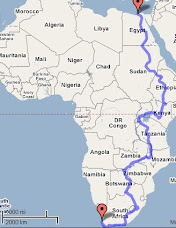 If we can cover this distance in about 11 days, surely we can do ~12,000km through Africa in about 45 days... This was a trip filled with testing the limits of the KLR, old friends, and new friends (cue Farmer Bob). Peter keeps talking about trying to do the whole loop in 72 hours. I'm game, but maybe only once we have better bikes. Sam and I are quite happy to let you know that we've been sponsored by First Gear. In other words, our first gear is First Gear. They've kindly agreed to give us a couple of TPG Rainier jackets. These are top-of-the-line 3 piece jackets. We'll certainly be putting them through their paces, particularly when we make the transition from 40 degree heat in Sudan to rain in the Ethiopian mountains. In the meantime, thanks to First Gear. James Bay and the North Road. September 2006. 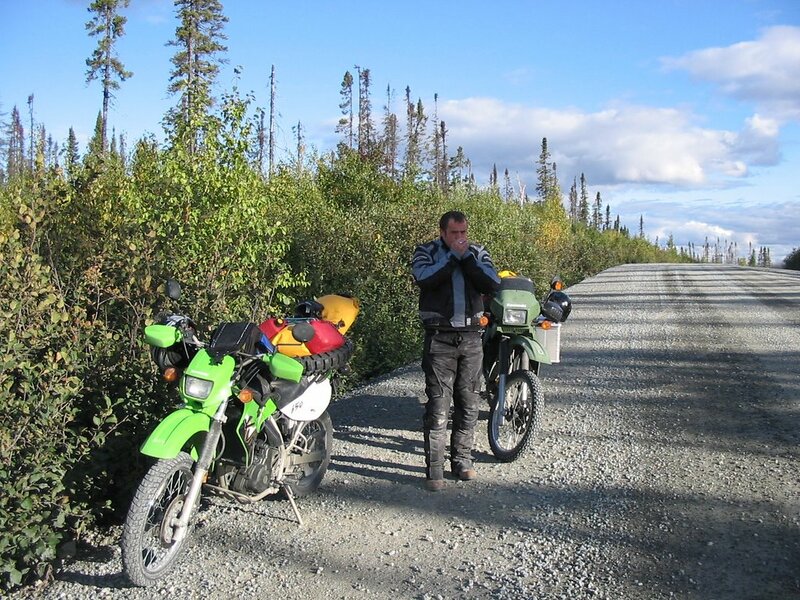 In September 2006, Sam and I rode across the North Road and up to the top of James Bay. This is an account written up soon after. Sam and I left for James Bay on Friday night. 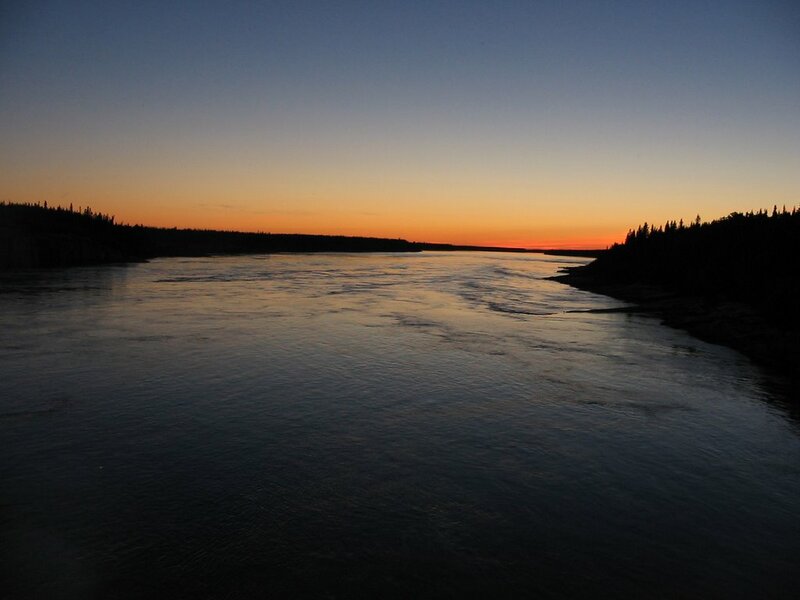 We’d been planning for a couple of months to travel to Chisasibi, a native town on the northeast corner of the bay. It’s a fairly simple, if long ride. 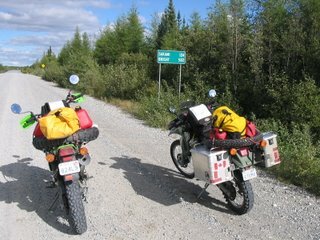 After winding your way 670 kms from Ottawa to Matagami, you get on the James Bay Highway and drive north on the same road for 600 kms. Some time after passing the 52nd parallel you turn left and head to the Bay. However, we decided to complicate the trip. 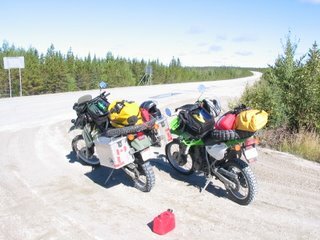 We would first head to Chibougamau, 250 kms north of Lac Saint Jean, and then travel the Route du Nord 400 kms to the JBH. We suited up on Friday night and left later than we should have. Michael Ignatieff is to blame, but that is another story. 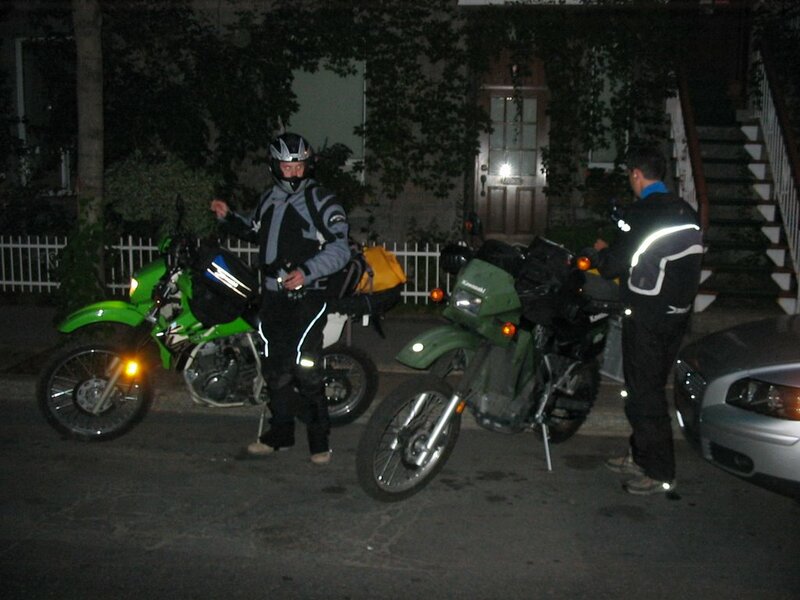 We rode through a heavy rain as far as Trois Rivieres, and then turned north for Shawinigan. I watched Sam avoid a collision on a combined on/off ramp. I soon did the same. Add another small blessing to the pile. The bikes performed admirably, as did my gear. Pushing through the rain at 110, I was quite certain I was prepared for the elements farther down the road. 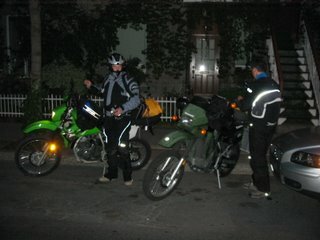 After a couple of hours of solid and straight riding we stopped in Shawinigan for dinner. We had set reaching Roberval as our goal, but night and fatigue overcame our best intentions. Winding along the Grane Mere, we finally stopped in Parc des Chutes, just south of La Tuque. We’d pushed 300 kms through the fog and rain. 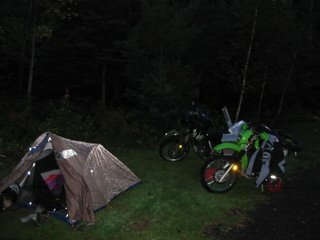 We quickly found a patch of grass beside a parking lot and set up tent. My head went down at 2 am only to be followed by a fitful sleep. I was nervous about the North Road. Sam and I were both awake at 6 am. I think his sleep was like mine. We were both staring down a long day in the saddle and we both wanted to make time. We packed up and scored breakfast in La Tuque at a small truckstop. We then saddled up and pushed into grey clouds and fog. The gray lifted as we crested a hill over Lac St Jean. Lucien Bouchard once said he would have been a federalist if he had visited Vancouver when he was young. Seeing the sun shine over the Saugenay, with blue mountains across the lake and farm land stretching out forever I was for a moment a sovereigntist. This is enough beauty for one country. We turned left at Roberval and stopped in at a Canadian Tire for some gear additions. It was noon by now, but we were still cold. We bought more gloves and hot packs for the ride up north. 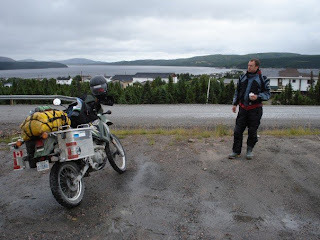 All told, would we finish the day about 450 kilometers farther north, and in near-Taiga. We tried to prepare for the worst. 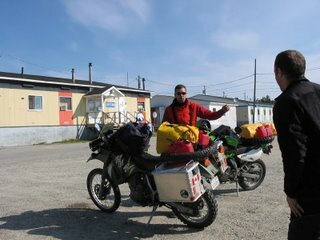 After we suited up again we headed for Chibougamau, doing to 250 kms in one hit. Sam led most of the way, and I was happy to follow. He is the perfect riding partner. Cautious, but not slow. Adventurous, but not careless. And he is always willing to push a bit farther. By late afternoon we had reached Chibo. Fifteen kilometers north of the city we found the Route du Nord. 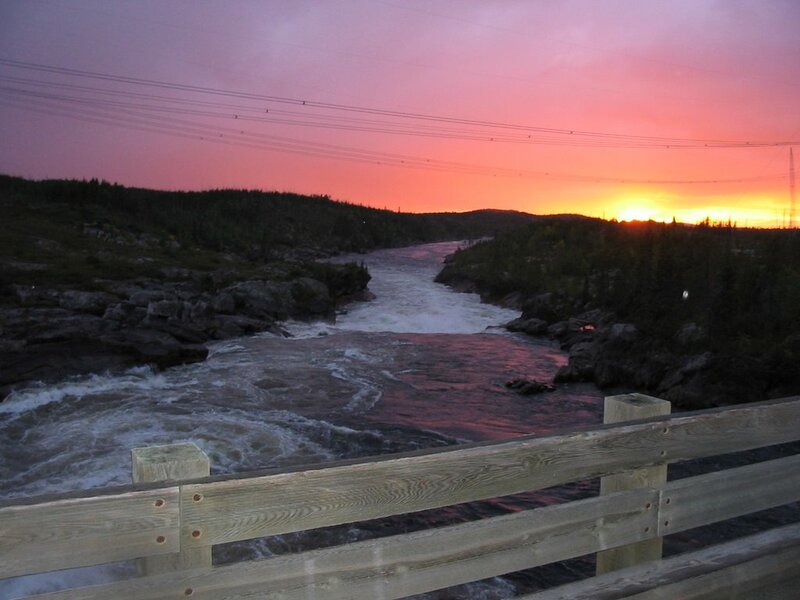 Originally built to access cut blocks and hydro projects, the road winds some 400 kms across northern Quebec, running west and then turning North. During the week, the road is filled with logging trucks. As we are running on a Saturday, we are all alone. In the 300 kms we cover on Saturday, we see less than ten cars! Mostly, it is just skimming along on top of the gravel. The guides I have read suggest observing the speed limit, which is just 70 km/h. This is clearly too slow, and soon Sam and I are pushing 110, eyes peeled for large rocks, fighting occasionally against front-wheel dives in the berms, and always keeping an eye out for animals. The bikes love this terrain. We let a distance grow between us, so we are not riding in each other’s dust. We stop to meet up ever hour or so. This is the ride we’ve been waiting for: challenging, isolated, fast, and adventurous. We grin from ear to ear. It is in the corners that the counter intuitions of a motorcycle become clear. At speed, your wheels want to slide out under the gravel, and the bike wants you to take a straight line to the outside of the corner. The mind tells you to slow down, lean forward, and steer into the corner. The mind is wrong on three counts. Rather, you punch the throttle, stand up a little on the outside peg, and push the bars away from the inside corner. The bike leans and grabs a line and shoots out the corner. Everything you thought was right was wrong. After 250 kms the sun is diving behind the hills and night is coming fast. 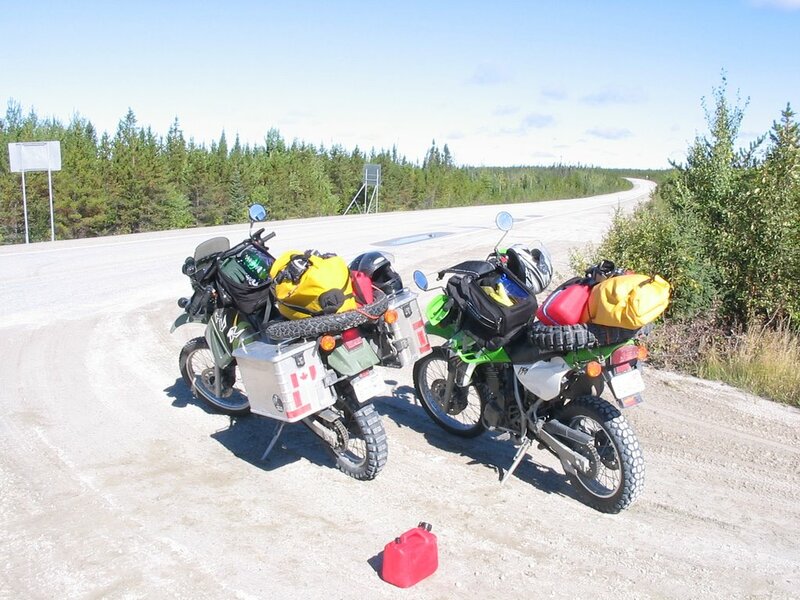 We resolve to push as far as Nemaska, where we can get gas for the first time in 300 kms. We will decide then whether to spend the night. Soon after this we cross the Rupert River. Seeing the river is part of the reason for the trip. The Rupert flows like an artery across the middle of Quebec, emptying millions of gallons of fresh water into the bottom of James Bay. It is spine-shattering rapids and wide, sweeping swathes of water. 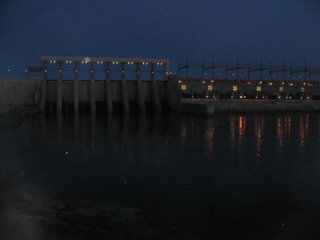 It will be diverted next year for a hydro project. But for now it flows, and we were keen to see it in all of its majesty. It was literally breath taking. As we looked out over the river we saw a campfire on a landing above the rapids. We then turned around to see a fellow casually strolling down the bridge toward us. 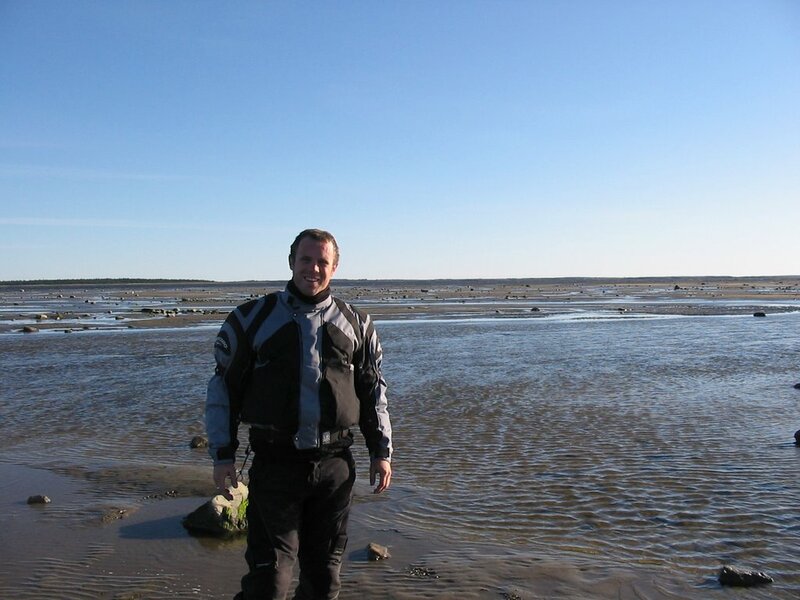 In the middle of nowhere we met Benoit, a Frenchman now living in Trois Riviere. 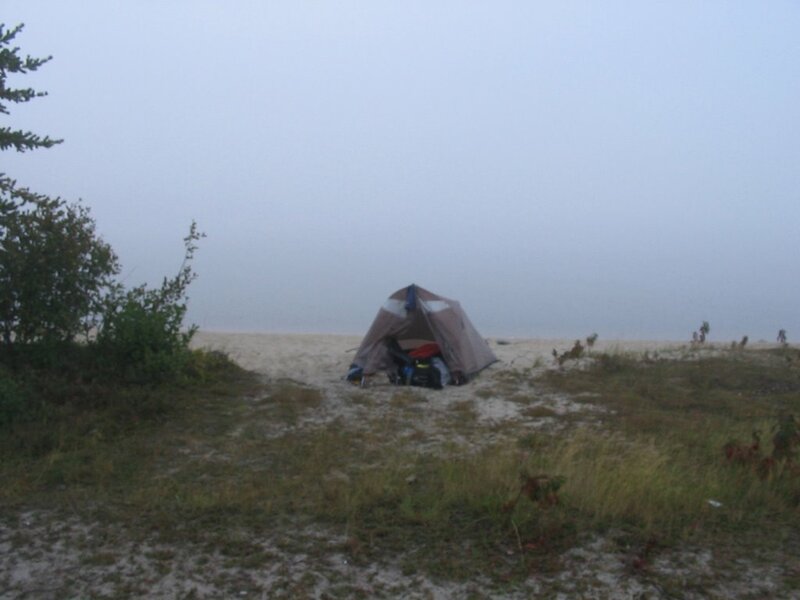 He regularly camps alone in Quebec’s wilds. We enjoyed his brief company immensely, and he obliged us and took a picture of Sam and me above the rapids. 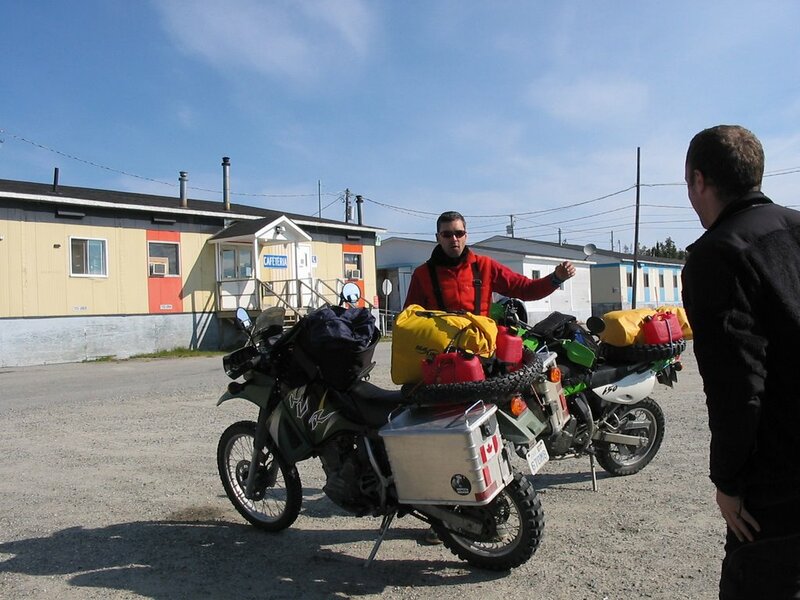 We then pushed on for Nemaska, a native town at kilometer three hundred. We had traveled 700 kms by the time we arrived, and decided to call it a day. But first we rode across a narrow isthmus into the town and gassed up. David, the station attendant, told us we could stay on the beach of the narrows. He said normally we could stay on the beach at the other side of the town, but everyone was there for a wedding party. So we headed back out the narrows and found the most beautiful campsite. A beach ran along a bay on Lake Campion. We pitched our tent and set to making dinner. We soon welcomed what seemed like a parade of visitors. Each one stopped to make sure we were alright. A village elder named Sam offered us the hospitality of his home. We declined, but he did accept our invitation to tea. He told us the story of his birth, brought forth in the bush by the light of embers. The candles had run out. He told us how Nemaska had been built after Hydro Quebec flooded his old home. He told us of his camps all over the region, explained the Caribou and moose hunting seasons, answered all our questions about the local fishing. And then he moved on, but not before extending an offer of lodging again. His welcome warms me still. Sam and I woke up early in Nemaska with all the narrows covered in fog. We could only take the locals’ word about the beauty of Lake Campion. We made a quick breakfast and packed up the bikes. 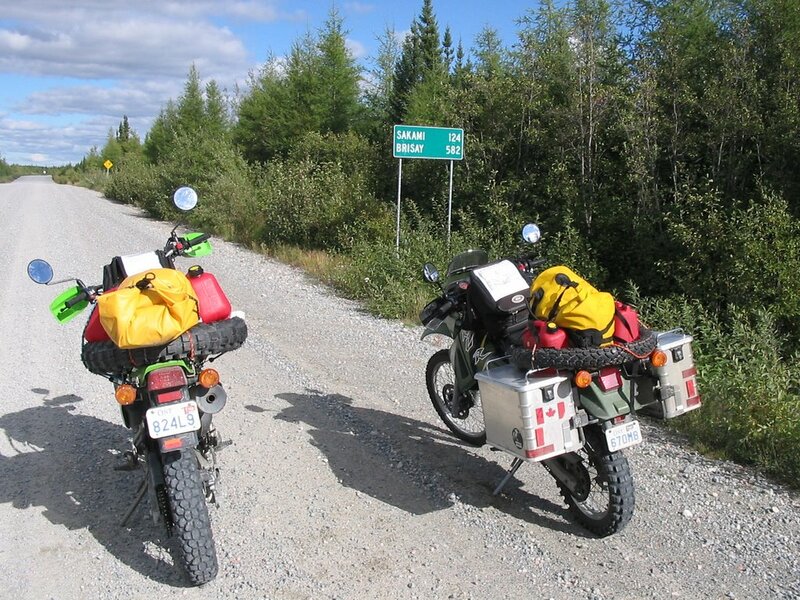 We would ride another 100 kms of gravel north west, and then meet the James Bay Highway at kilometer 275. Pushing along near top speed on the gravel we ate up the road in an hour’s time. When we reached the JBH we had only 434 kilometers to Chisasibi. It is counterintuitive how the miles accumulate when you are this isolated. When you ride through a populated area every town and rest stop reminds you that you are traveling a long distance. But left with only long sweeping curves, burned out forests, small mountains in the distance and lake after lake, the distance becomes arbitrary. Instead, the mind is on holding the finest line through the corner and keeping the bike at top speed despite admonitions to drop to 85 km/h. 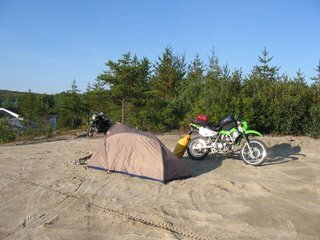 The KLR is a fine bike, and bulletproof. But it’s on roads like the JBH – wide-open and unpatrolled – when I wish I had a bike that could easily cruise at 150 or 160 km/h, like this or this. All in good time. About an hour after entering the highway we came upon Relais 381. It is a town – of sorts – at kilometer 381 of the JBH. It exists to pump gas at exorbirant prices and charge $1 for two day old hard boiled eggs. Sam says it’s the crappiest town in Canada. I reserve comment. Fuel tanks filled, we took off at just after noon for Chisasibi. On the way we passed the Trans-Taiga road, a 700 km eastward ride into the middle of nowhere. At its end you lie farther from a town than on any other road in North America. We were taken by its isolation, and pointed the bikes down it. But time would not permit the trip this time. We arrived three hours later. 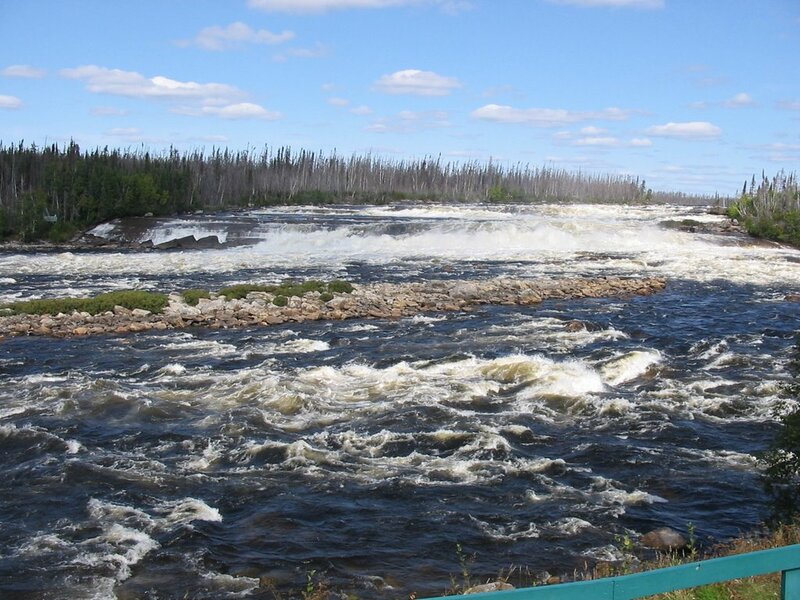 A mostly native town, Chisasibi sits 90 kilometers west of the JBH on the La Grande river, just downstream from the great LG1 hydroelectric dam, and just ten kilometers upstream from James Bay. We pushed beyond the town looking for some trail to James Bay. 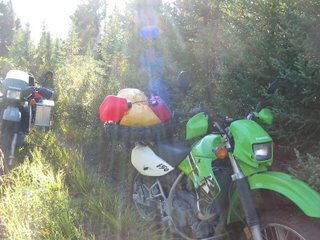 Somehow we ended up on ATV dual track which kept getting thicker and thicker, turning towards and then away from the river. When we decided this was not the way to the bay we turned around and started a back track. Anxious to get to the bay I kicked up the speed of the bike and upshifted a couple of times. Riding in deep ruts, this was a bad idea. It was only a matter of seconds before I hit a bad series of bumps and inadvertently hit the throttle. The bike rocketed ahead, then over, they into a tree. I ended up beside it and ahead of it. Laying on the trail I took a few deep breathes and gave everything the once over. Trailing not far behind, Sam inspected everything. I then made my way back to the bike, which fared better than the tree. The front wheel and fork where fine. Nothing was broken, and the mirrors but needed adjustment. At this point I got mad at Sam for not taking pictures of the crash. He wanted to make sure I was fine before snapping pics. That’s what friends are for, apparently. 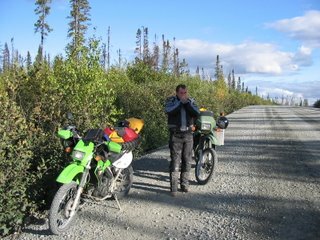 Back at speed, we left the trail and then found the three lane wide dirt road which leads to the Bay. Apparently our observational skills match our navigational skills. We passed a steady stream of pick up trucks and cars on our way to the Bay, and arrived after ten minutes. All the riding had been worth it. I cannot imagine a better scene. The water stretches past the horizon, the sky goes on forever, rocks come up from the water at low tide, and fishing boats and drying racks dot the shore. The flow of Le Grande is great enough that you can taste just a trace of salt in the water. 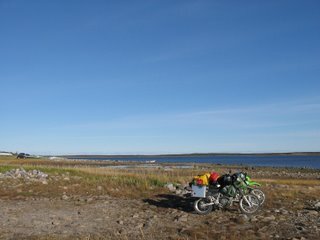 We considered cooking dinner on the shore, but the air was getting colder and we knew we had a long ride to the Rupert River at km 257, where we hoped to spend the night. 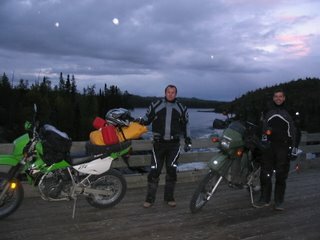 So we decided on dinner in Chisasibi and a long ride through the night to the Rupert. We’d never make it that far. After Sam and I left the shore we headed to Chisasibi for dinner. 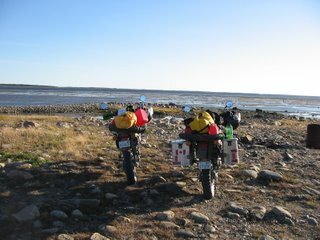 Food in our bellies, we would ride in the dark to the Rupert River at kilometer 257. For those counting, that’s 90 kilometers out from Chisasibi, and then 343 kilometers on the JBH. On the way out of Chisasibi we took a quick detour to see LG1, one of the great hydroelectric dams of northern Quebec. My eyes don’t see well at dusk, so it was a fine time to get off the bikes for a few minutes. We soon discovered that we could ride across the top of the dam, and then to a viewing platform downriver. It is hard to capture the scale of the barrage, but it is 1.3 kilometers wide and 160 meters in height. The sun completely down, we set off for the JBH. By the time we reached the highway I was freezing. The temperature had dropped close to freezing, which makes it several degrees colder at speed. We stopped to regroup, adding whatever layers we had. We also used the last of our heatpacks. It was ultimately all for not. Within 100 kilometers I could barely keep my legs from shaking, and my speed was dropping continuously, a tell-tale sign of fatigue. Soon after that I was convinced I could see frost on the trees, and the miles rolled by dreadfully slowly. What seemed like an hour would pass and we’d be just ten kilometers closer to our goal. The steady stream of northbound logging trucks soon proved a hazard, as I began to fear drifting across lanes, especially as it became more difficult to hold our lines through the corners. Then, at km 470, we hit a fog which swallowed our front wheels. It was only with good fortune that we were alongside Lake Mistanikap, dotted with Cree summer camps. We set up camp as quickly as we could. Chilled to the core, I slept in all my gear. I woke up late the next morning. It had been an awful ride the night before. And today we had 1100 kms to home. Still, I looked forward to the challenge. Even when I pushed my head outside of the tent and proceeded to cough up a bunch of blood. We tried to be efficient in cleaning up camp, but the long night had gotten the better of us. Sam dropped his bike in the sand twice. I almost dropped mine once (and had dropped it twice the day before). But we soon resolved ourselves to the task and set out. We rode a hard pace to Relais 381 where we would gas up for our longest stretch yet without fuel. Then, filled up on some mixture of Red Bull, ginseng, and Gatorade, we headed for Matagami. It’s hardly heavy fuel, but it will keep you eyes up on the bike. At km 257 we finally hit the Rupert. We had crossed it earlier on the North Road, but there the river was nothing like it is here. 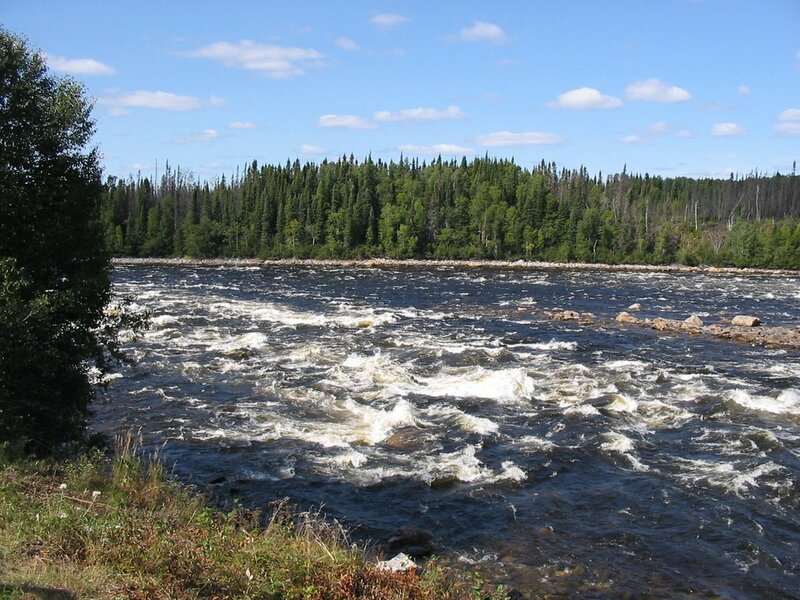 By the time the Rupert crosses the JBH is has collected much more water, as several more lakes spill into its stream. I had seen pictures before, but they did nothing to capture the scale of the rapids. It takes little to imagine the most calm line leading to smashed canoes. And it is inconceivable that one could run the roughest section of the cataracts. This is, quite literally, a deadly river. It is a kilometer of crashing. crushing rapids. There is nothing calm or serene about it. The Queen of the North, it is one of Quebec’s greatest possessions. As I’ve written below, this is not for much longer. Sam and I briefly discussed the merits of damming the river, given how much power it will provide and how much wealth will accrue to the Cree nations as a result. But it really doesn’t make up for the loss. We had little time to stay – we had to get back to jobs and studies. Life rolls on like the Rupert, apparently. Until it doesn’t. From the Rupert we rode a little less than 900 kilometers home. I rode about 80 more than Sam, on account of his bike breaking down in the Gatineaus. The cause remains unknown, despite he and I performing a number of simple tests on the roadside, guided by my dad on a cellphone. I ended up winding the last 80 kilometers home following a tow truck with Sam’s bike. It was a poor ending to an extraordinary trip, the thoughts of which keep flowing. As foreshadowed by Peter in a previous posting, it’s time to announce a new fundraising objective for Spread the Net. You all were so generous that we came close to meeting our initial goal in only a couple of weeks… Since this whole adventure is firmly rooted in a sense of realistic challenge (provided we are issued visas to Sudan), it just seemed a little too easy. And besides, Spread the Net is a REALLY good cause. So, we are setting our sights on raising $50,000, or the equivalent of 5,000 nets. Clearly, reaching this new, higher objective is going to take us some time, but we look forward to holding some events and finding other creative ways to support an organisation that is really effective at alleviating malaria. If you are interested in learning a little more about why bed nets are one of the best ways to reduce malaria, this recent article published in the Economist is a good summary. For some time there has been a really interesting debate about whether it’s best to give malarial nets away for free or sell them. New research from the World Health Organisation shows that giving them away is actually preferable. UNICEF, which is the implementing partner for Spread the Net, gives the nets to individuals most vulnerable to malaria (children under 5, pregnant women and persons with HIV/Aids). On a personal note, it’s hard to believe this is my first blog posting ever (I’m definitely going to be the old man on this trip…). Anyway things have changed dramatically in my own life over the past week; I moved from Ottawa to Afghanistan. For the next months I will be working at Canada’s Provincial Reconstruction Team in Kandahar City doing a review of CIDA’s operations in the province. Under normal circumstances my jetting off might have left our trip in the lurch, so it must be said that Peter is truly a saint as he has offered to handle many of the preparations from Canada. There is a fair bit to do and while I’ll try to do my bit from over here, I will be mostly focussed on the task at hand, situated on the other side of the world and living in a context of great instability. You'll have to forgive me if I don’t post on this blog all that often. The Great Anamitra Deb is going to put together a soundtrack for our trip. But in case he doesn't, I'd like you, the faithful reader, to do so. We'll call it Volume 2. I remember my life through music. I associate songs with friends, places I've lived, meals I've eaten, even the most precisely recalled but meaningless moments. I've taken to listening to my iPod when I ride. As a consequence, I can recall the precise moment in LCD Soundsystem's "All My Friends" when Sam and I came upon a long line of cyclists along Route 138, just east of Forestville on our way to the Trans-Lab highway. The same place animals go when they die. Those lyrics will for a long time be tied to my trepidation that morning . If caribou could be shot on the road then they could also certainly come into our path. But they also remind me of how great was my feeling when we arrived for the ferry on time on a route others were convinced we couldn't beat the clock. So, what songs are going to make the trip this time? They need only meet a few conditions. They should have a good beat, clever lyrics, and maybe geographic or travel references. You can email your suggestions and reasons at pjlwn@mta.ca, and I'll post all suggestions on the site. At the two-week mark, we are now at 85% of our goal. So, it's time to increase it. The new goal shall be announced in due course.